John Charles Meussdorffer earned high place among the pioneer business men at San Francisco, where he established perhaps the first hat factory, and some of his sons continued this business, so that the name is still actively identified with the manufacture and sale of hats in San Francisco. The late John C. Meussdorffer was born at Kulmback, Germany, April 9 1823. He was educated in Germany, and served his apprenticeship as a hat maker at Paris. In 1847 he came to America and located at St. Louis, following his trade. Early in 1849 he joined an ox train bound for California across the plains, and he walked practically the entire distance reaching San Francisco September 19, 1849. He immediately went to the mines, but after a brief experience there returned to San Francisco and established his hat factory. His business was continued for many years as the J.C. Meussdorffer Hat Manufacturing Company, and with increasing trade he established branch stores in Sacramento, Marysville and Portland, Oregon. The finest hats in California were manufactured by this firm, and in the early days the regular price for a piece of Meussdorffer headgear was from twenty to thirty dollars., J.C. Meussdorffer interested himself in other lines of business also, buying and selling real estate, and built some of the early apartment houses of the city one of them located on Third Street. He personally landscaped the beautiful grounds around his own home. He was at one time president of the German Hospital and a member of various charitable organizations and his public spirit and generosity were expressed in many ways for the benefit of this community. He was a member of the Society of California pioneers. In the early affairs of San Francisco he served on the Vigilantes Committee and a member of a volunteer fire company. 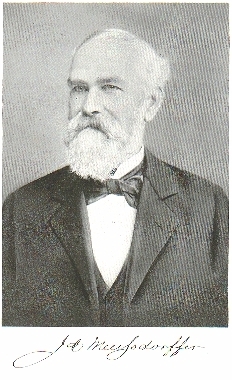 In his prosperous early career he induced some of his brothers to come from Germany, and he established them as managers of his branch stores. John Charles Meussdorffer, who died December 3, 1894, at the age of seventy-one, by his first marriage had one son, Harry C., a retired resident of San Francisco. He went back to Germany for his second wife, Caroline Pflueger, who was born in that country. They were married in May, 1868, and he arrived with his bride at San Francisco December 24 of the same year. To this union were born eight children: John C., who was in the insurance business at San Francisco and passed away May 2, 1923; Oscar E. and Arthur H., who still continue to represent the family in the hat business at 824 Market Street, under the name of J.C. Meussdorffer Sons; Waldemar, manager of a business concern at Redwood City; George, who was in the hat business and died in 1921, at the age of thirty-five; and Ottilie, Alice and Irene, all residents of San Francisco. Miss Ottilie’s home is at 487 Hanover Street. The son Oscar is a member of the California Pioneers Society and of Stanford Parlors of the Native Sons of the Golden West. He is also affiliated with the Elks and is a member of the Olympic Club. Miss Ottili and Miss Irene are members of the Daughters of the California Pioneers. Mrs. Meussdorffer is a member of the Woman’s Auxiliary of California of the California Pioneers. Source: "The San Francisco Bay Region" by Bailey Millard Vol. 3 page 92-95. Published by The American Historical Society, Inc. 1924.